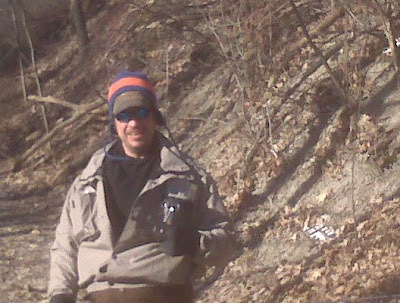 Well one of my muskie fishing friends Joe W. joined me on the stream today. I met him at the parking lot at 7am and it was about 19 degrees out. I told him to pack it in for an hour or so and we would go back out later. We waited for the temp to hit 25 degrees and we decided to walk to the estruary to check it out. 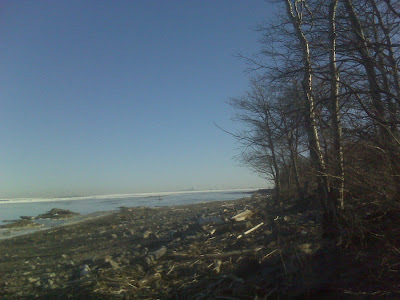 When we arrived to our dismay, the entire mouth was frozen over with a thin transparent layer of ice. We said WTF and decided to sit on a few stumps and enjoy the scenery. We noticed a beat up drop back male steelhead cruising the shoreline under the ice. That was pretty cool to see. At this point we drove upstream to hit the areas where some fish were spread out in faster water earlier in the week. We tried our best and hoofed it for quite a while with no luck. The water was getting very clear and the current was very light. This trib needs water soon! Joe W. was happy none the less. He was in nature and he loves walking through the gorge and up to the lake. He was just happy to be out with his busy schedule. On the other had as he knows his good friend and author of this blog has been on the verge of insanity with his unemployment situation so he brought me gifts and bought me lunch. Joe out of the goodness of his heart provided me with a breakfast sandwhich along with two other things. The two other items were a copy of the http://www.amazon.com/Reflections-Art-Living-Campbell-Companion/dp/0060926171 and an empty note book. He like my future brother in law, Mike, are big believers in the teachings of Joseph Campbell and the philosophy of following one's bliss. He instructed me to read the book and write down my goals , likes, and dislikes in detail when ever and where ever it strikes me. Hopefully this will help me through the existential angst I find myself in at this time. WTF am I doing on this planet? I am here to fish for Steelhead. Isn't that what this blog is about? Exploring my minute to minute feelings both good and bad as I walk the streams like Jesus searching for my redemption and answers to my highly valued and sometimes completely worthless existence on this planet. Someday I will find the answers to those questions and more. But for now, I am whole when I am knee deep in emerald green with chrome on the business end of my line. You have a heart of gold and you are one of the few people I know who lives blissfully in the moment, Happy on the Niagara fishing or hanging out with your pack of Labrador retrievers. Hang in there brother. Better times ahead! But for now enjoy the moment and ability to do what makes you feel right...fish.